For years, your patio hasn’t been much more than an unsightly space. Now imagine if this area was a destination or even a backyard retreat. 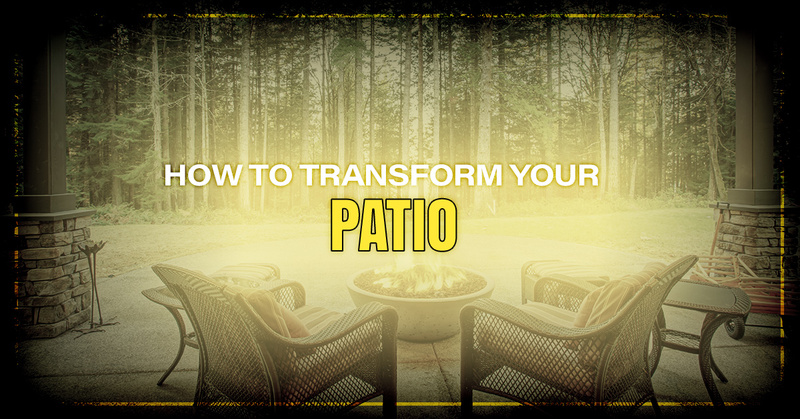 Believe it or not, upgrading your patio doesn’t have to break the bank. We all seem to have that one nosy neighbor. A well-designed patio can actually help you take back some much-needed privacy. Plant shrubs, vines, or small trees in strategic places to block views. Not only will additional greenery keep your neighbors from watching every move, but it creates an urban oasis of sorts. Don’t be surprised if you find yourself out on the patio more as a result. Just because your patio might be smaller doesn’t mean you can’t enjoy it. If there’s only room for a bench and a small side table, so be it. All you really need is a quiet corner to enjoy Mother Nature. Does your patio seem a bit boring? Containers are a great way to breathe new life into this space. Take some time selecting pots and plants that fit the patio, as well as your personal tastes. Think of the patio as an extension of your home’s interior. Be honest with yourself: How much time would you spend in the backyard if you had no outdoor furniture? Probably not a whole lot. So look for tables and chairs that are both practical and stylish. You shouldn’t feel like you need to purchase the most expensive furniture set, either. It’s easy to go overboard with furniture and plants on the patio. Don’t forget that you will want a focal point and gathering place somewhere. For smaller patios, this might be something as simple as a small tree, container, or statue. A focal point brings everything on the patio together and creates a much more organized, appealing, and comfortable space. We touched on this briefly but it’s worth elaborating on for a moment. While your friend might have a large, spacious patio, yours could be quite a bit smaller. Don’t let size discourage you from making your patio a destination. Candles and light fixtures, for example, are effective ways to help you get the most out of limited patio space. Take a long look at your patio. Is the concrete starting to sink and become a safety hazard? If so, then it’s time to get in touch with an experienced concrete contractor. At Concrete Leveling Technologies in Austin, we use a two-part polyurethane foam to raise concrete slabs back to their proper position. As opposed to traditional methods such as mudjacking, poly foam is an environmentally-friendly solution. So there’s no need to worry about the foam breaking down or releasing harmful chemicals into the soil. Our concrete services are ideal for patios, pool decks, driveways, sidewalks, and more. Contact our concrete leveling team today.